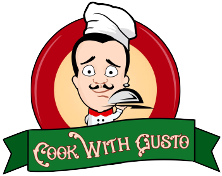 Does the hustle and bustle of the holiday season-shopping for Christmas gifts, running errands, writing cards- leave you with no time for cooking? This recipe is for you. Pass by Franco’s stall and buy his wonderful pasta. 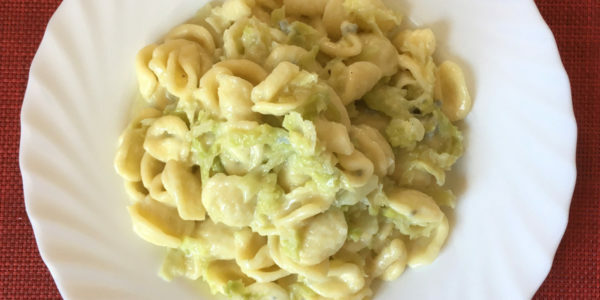 While you are there, you will surely find another local selling fresh cabbage, and another selling some good blue cheese (gorgonzola if possible but Stilton or Danish blue cheese will also do the trick). That’s all you need! 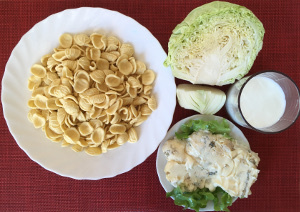 When you arrive at home, you can prepare this delicious but easy recipe in 15 minutes. You can also make this recipe all year round, using other fresh seasonal vegetables. 1 medium sauce pan, 1 non-stick pan, 1 chopping board, 1 knife, spatula. Trim cabbage, wash, drain, and cut into thin ribbons. Peel onions and finely chop. Into a pan, pour 2 tablespoons of oil, add onions and gently cook them until very soft, about 5-7 minutes. You can add some warm water to prevent the onions from becoming too dark. Add the cabbage, then 1 cup water. 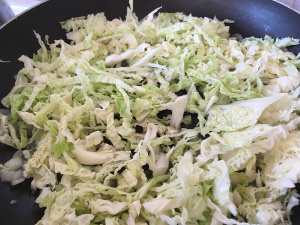 Sauté cabbage and onions for about 10 minutes until very tender. Meanwhile, pour water into a medium saucepan, put on the stove, bring to a boil, and add salt. 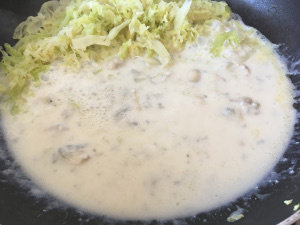 When the cabbage is cooked, use a spatula to move it to one side to make space in the centre of the pan, then add milk and butter. Cut gorgonzola into small cubes, add to the milk and let it melt. 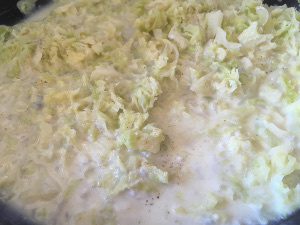 Mix the gorgonzola sauce with the cabbage. 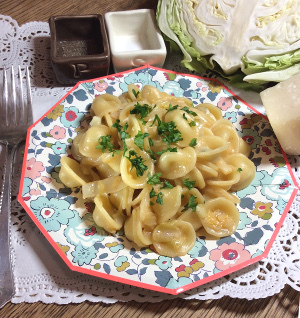 Put some of the pasta water into a teacup and set aside, then drain orecchiette when “al dente”. 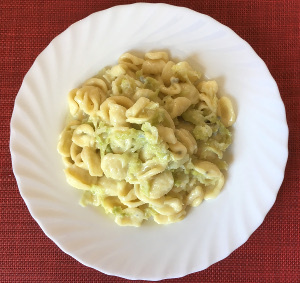 Pour drained orecchiette into the pan with the cabbage and gorgonzola sauce, add a few tablespoon cooking water if needed. 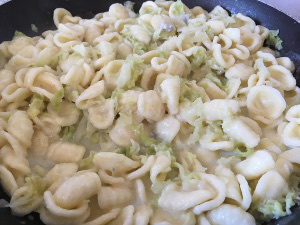 Quickly mix the orecchiette, and then place portions onto serving plates, topping with grated Parmigiano cheese and chopped parsley if you like. Enter your details to learn the secrets of the perfect pasta!